Overwatch League’s first season is only a few weeks old, but already, a pecking order has begun to form. At the top, there’s Seoul Dynasty, the dynamite Korean roster that hasn’t lost a single match. Way down at the bottom, meanwhile, are the Shanghai Dragons, who have been grinding their wrists and keyboards into powder each day from 10:30 AM to midnight to try and catch up, but progress, while noticeable, has been slight. Yesterday, Seoul and Shanghai played each other. Ahead of the match, fans expected carnage. Reddit user MissingPear was so certain of it that he bet that Shanghai couldn’t even win a single map of the four-map set against Seoul. 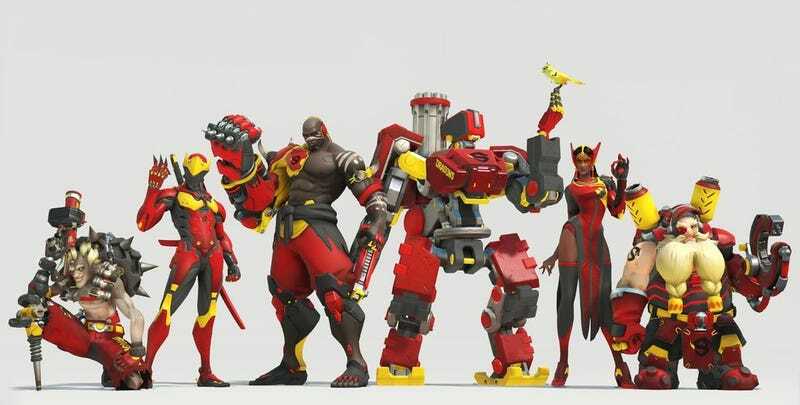 If he was wrong, he said, he’d buy every Shanghai Dragons skin in Overwatch—one for each of the game’s 26 heroes. Last night, against all odds, Shanghai put up a decent fight against Seoul, a team so supremely confident that they declared themselves a dynasty before Overwatch League even began. For most of the match, Shanghai made a fight of it, but failed to actually take a map. Then, during the fourth and final game, they finally put it all together and snatched Mexico map Dorado. Sure, Shanghai had already technically lost the match by that point, but they dented the armor of the best team in the league. After toiling away at the bottom of the rankings for weeks, that’s gotta feel good. Afterward, MissingPear made good on his bet, posting images of his new Shanghai Dragon skin set (a totally cool and normal phrase) that he spent $100 to acquire. “GG,” he said at the end of his post.